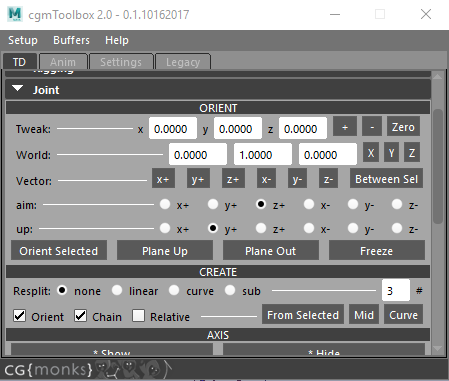 cgmJointTools is our attempt at an all in one joint creation and orienting tool for our own purposes. We hope you find it useful as well. 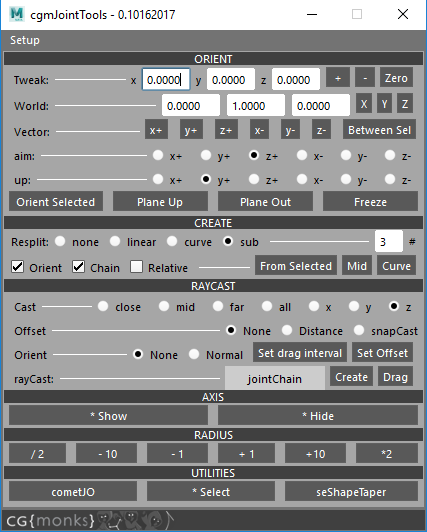 When you load it as a standalone, RayCast create options are availabe as well. Seemed overkill to have that in the Toolbox version as well. Full props to Michael Comet for the logic on this one in his fantastic cometJO. Change the current jointOrient values on selected joints by provided amounts in a relative manner. Zero - Clear out the fields. With orientation we're talking about the up vector for aiming for the orientation processes. We have a couple of ways of defining it. World - You can set to standard axis by the X, Y , Z buttons or manually input values. Aim/up axis directions are how joints will be aimed and oriented. Aim is from one to the next in the chain, up will go by the defined world vector. Relative - Affects orientation. Relative mode reevaulates the up vector from the parent. This supports better orientation for twisting joint segments. Plane Up/Out - Planar orientation creates a snap plane to help fingers and limbs for examples all be on the same rotation plane. Up/Out defines which axis the plane will be cast through - the joints up or out axis. For fingers, you probably want up. For an arm out would probably make more sense. Freeze - Our freeze orienation function as we don't like maya's. Joint creation is based on selection. There are several main methods. When we resplit, it can be by the selection generated curve or an existing one. Mid only creates mid joint from selection. The other modes support the extra behaviours. What follows are the options that each mode can use. /2 - In this case take current, then divide by 2.